According to the in-flight map, greetings from 35,000 feet above St. Louis en route to the 2017 PromaxBDA Conference! Hard to believe this is roughly my 20th (!) Promax (I’ve missed a couple over the years). My first Promax Conference was in Toronto in 1998. It was my first real business trip, just 2 years out of college working as a writer-producer for WBDC-TV WB50 in Washington, DC. It was quite an experience for a kid outta the University of Scranton, getting to leave the country and mingle with some of the most creative people in the industry. This was right at the start of the “heyday” of the WB (if you can say it really had a heyday). 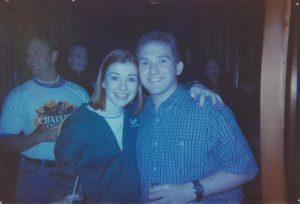 I got to party with the cast of Buffy, including the very awesome Alyson Hannigan who spent a good 15 minutes just hanging out and talking. We were the same age and I will admit I was totally smitten (sorry, Amy!). Sadly, Sarah Michelle Gellar and David Boreanaz skipped the party, but it was a blast nonetheless! We also had a reception with the cast of “Earth: Final Conflict,” which was a better show than it gets credit for in my opinion. It was the original brainchild of the late Gene Roddenberry, and his wife Majel Barrett Roddenberry, who also played Nurse Chapel on the original Star Trek, was the executive producer and was there meeting everyone. I had become a Star Trek fan back in my childhood, watching a black and white TV down the shore (Philly-speak for going to the beach, specifically Ocean City, NJ, for us) with my grandfather, stumbling on a rerun of “The Menagerie,” the repackaging of the original 1960s Star Trek pilot, “The Cage.” I was hooked. So, when I got the opportunity to shake her had, I’m sure I was a blathering idiot. She was probably used to it, but at this point in my career, this was a pretty big deal. If this wasn’t enough, “The Jerry Springer Show” hosted a party at the Hockey Hall of Fame. I grew up outside Philadelphia, and hockey was always my favorite sport. I was raised a Flyers fan, and my parents told me stories of how when we moved into my house at the age of 2, I took a broom and shot a tennis ball into the corner of the empty house and yelled, “Score!”, imitating the late Gene Hart when my idol Bobby Clarke scored a goal. The Flyers won the Stanley Cup the year I was born and the year after… and I’m still waiting to actually see it happen with my own eyes 40+ years later! But here I was, wandering the Hall seeing Clarke’s jersey enshrined and getting my picture taken with the Stanley Cup (the same night the Red Wings were completing their sweep of the Capitals in the Finals, again sorry Amy!—there are 2 Cups if you didn’t know, by the way). So to all my colleagues experiencing their very first PromaxBDA this week, a word of advice: Enjoy yourselves. Pace yourselves. Take it all in. Meet as many people as you can. Let it inspire and energize you. Use it to make your creative even better. And share some of that energy and enthusiasm with us grizzled veterans who can easily get jaded after a couple decades. Our industry is changing, and you are the face of the new. And to my fellow TV vets, remember that we all had people that mentored us along the way and now it’s up to us to play that same role for others. But as quickly as our business is changing, we can learn as much from the new kids on the block as they can learn from us. So let’s make this week about sharing. Sharing ideas. Sharing inspiration. Sharing stories. Our industry is changing, but it will always need great storytellers. And a new chapter begins today.